Dr. Scholl hopes that the book will serve as a resource for practicing ophthalmologists as well as scientists in fields outside of ophthalmology. "This book is the first to explore the consequences in ophthalmology for an aging society. I think both practitioners and researchers will find it to be a useful resource on the current body of knowledge on eye diseases affecting the elderly." 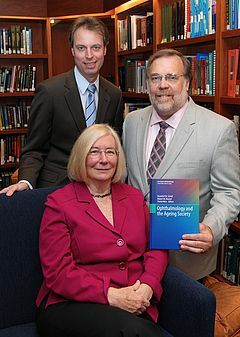 Dr. Hendrik Scholl, Dr. Sheila West and Dr. Robert Massof (L-R) proudly display their recently-published book, "Ophthalmology and the Ageing Society"
Throughout the world, life expectancies are increasing, resulting in a major demographic shift. It is estimated that by 2050, 2 billion people worldwide will be age 60 and older, making it imperative that ophthalmologists as well as scientists and public health professionals understand the major eye diseases that affect an aging population and implications for patient care . Wilmer faculty members Hendrik P.N. Scholl, M.D., M.A., Sheila K. West, Ph.D., Pharm.D., and Robert W. Massof, Ph.D., hope to provide insight into the geriatric aspects of ophthalmology in their recently-published book, “Ophthalmology and the Ageing Society”. The book, a product of two years of research, writing and editing, provides an overview of the global epidemiology of ophthalmic diseases and addresses the diagnosis, treatment and quality-of-life considerations for cataracts, macular degeneration, glaucoma and dry eye. The book is the first in the Essentials of Ophthalmology series, published by Springer Science and Business Media. Additional Wilmer faculty contributors are Director Peter J. McDonnell, M.D., Neil M. Bressler, M.D., Pradeep Y. Ramulu, M.D., Ph.D., Catherine Meyerle, M.D., James T. Deremeik, RT, CLVT, and Judith E. Goldstein, O.D.